What Are the Benefits of Eating Raw Potatoes? Sylvie Tremblay holds a Master of Science in molecular and cellular biology, and has years of experience as a cancer researcher and geneticist. Jody Braverman is a professional writer and editor based in Atlanta, GA. She received a Bachelor of Arts in English from the University of Maryland, and she is a certified personal trainer, fitness nutrition specialist, and yoga teacher. She has written for various online and print publications, including Livestrong.com, SFGate, Healthfully, and Chron.com. Visit the writer at www.JodyBraverman.com. If you've ever popped a piece of raw potato in your mouth while you were chopping some up for a soup or stew, you know they have an interesting flavor uncooked. If it appeals to you, the good news is that, no matter how you eat them, potatoes are a rich source of nutrients that provide energy and boost your health. Raw potatoes are also high in resistant starch, a type of carbohydrate that may offer several health benefits. However, resistant starch may also cause digestive trouble. You also need to watch out for green potatoes which contain toxic substances — those potatoes shouldn't be eaten raw or cooked. Potatoes tend to get a bad rap because of their carbohydrate content, but they're actually quite healthy. They're rich in fiber, vitamin C, some of the B vitamins and the minerals potassium and phosphorus. Eating raw potatoes helps you meet your daily requirements for these nutrients. A medium raw white potato contains 5 grams of fiber, which is 20 percent of the daily value (DV) for adults. Fiber is the part of plant foods that the body can only minimally digest. It moves through your digestive system mostly unchanged, pushing food along and aiding regularity. Fiber can also help reduce the absorption of cholesterol into your blood stream, which can reduce your total cholesterol levels for better heart health. Vitamin C is crucial for a healthy immune system and wound healing, and it's also a potent antioxidant that could help prevent cancer and cardiovascular disease. One medium raw white potato offers almost 40 percent of the DV. It also provides 22 percent of the DV for vitamin B6, 12 percent of the DV for niacin and 10 percent of the DV for thiamin. As a group, the B vitamins are involved in metabolism and energy production and the formation of red blood cells. Raw potato nutrition also provides almost 20 percent of the DV for potassium and 13 percent of the DV for phosphorus per medium potato. Potassium helps balance sodium in the body and also aids muscle contraction and nerve transmission. Phosphorus works with calcium to support bone health, and it's also involved in energy production. Potatoes also contain a number of health-promoting phytochemicals, including phenolics, flavonoids, anthocyanins, and carotenoids. These powerful substances help fight free radicals that damage healthy cells and lead to the formation of disease. Read more: Are Red Potatoes Healthy? Cooking alters the nutrient composition of foods, the extent to which is highly variable depending upon temperature, cooking method and other factors. The weight of the food also changes when it's cooked, so comparing USDA nutrient profiles of raw versus cooked potatoes won't provide an accurate picture of the nutrient changes it undergoes. However, the water-soluble vitamins — vitamin C and the B vitamins — are most vulnerable to losses during cooking. As much as 55 percent of vitamin C content can be lost during cooking, depending on the cooking method. When potatoes are boiled, the B vitamins can leach out into the cooking water. A 2009 study in Journal of Zhejiang University Science B looked at the effects of different cooking methods on broccoli and found that all cooking methods besides steaming led to significant losses in vitamin C and protein. Cooking can also decrease the phytochemical contents of foods. Raw potatoes are rich in resistant starch, which is reduced by cooking. Like fiber, your body doesn't digest or absorb resistant starch. Instead, resistant starch acts as a prebiotic, or a food source for the gut bacteria so vital to your health. According to a 2017 study in Nutrition Journal, resistant starch can also lower post-meal blood sugar levels, which can aid diabetes management and prevent the fatigue and mood changes that can result from post-meal blood sugar spikes. Additionally, a 2015 article in Critical Reviews in Food Science and Nutrition reports that resistant starch may increase the thermic effect of food, thereby increasing total daily energy expenditure. Benefits aside, resistant starch can cause digestive distress. Although feeding gut bacteria is good for your health, it can cause uncomfortable bloating and gas, similar to the effects of eating beans. Potato plants naturally produce some toxic substances that act as defenses, but these are contained in the above-ground plant structure and don't affect the potato itself, which grows below ground. However, if a potato has been damaged, exposed to sunlight or kept in storage for a long period of time, it may develop sprouts and patches of green. The green patches are chlorophyll, a compound produced during photosynthesis. On its own, chlorophyll poses no danger; however, its appearance is a sign that photosynthesis is already underway. During photosynthesis, toxic substances, including solanine, are present. Consumption of these substances can cause vomiting, diarrhea and abdominal pain. 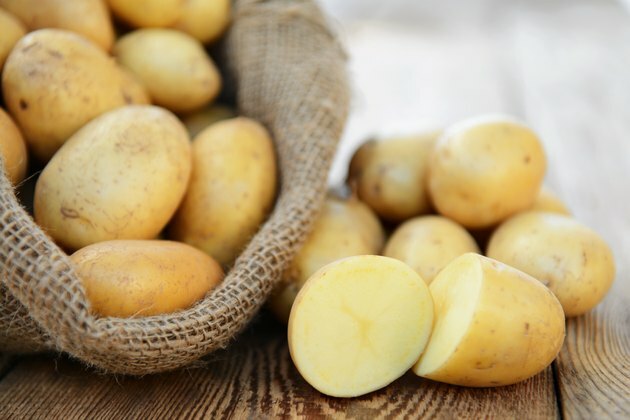 Read more: Are Potatoes Good for Weight Loss? The New York Times: Ask Well: Does Boiling or Baking Vegetables Destroy Their Vitamins? Does Boiling Potatoes Reduce Their Vitamins? Which Sweet Potato Is the Healthiest? Are Potatoes Good for Weight Loss?